Done with the sleeves for the blue Thermal, so I’m going to put it on hold for a bit while I finish a second pair of Kingdom gloves–this time in a color that’s light enough to see the cables. I have many sweaters; I need some darn gloves and since I managed to lose one of the dark green ones after one wearing, I am forced to knit again. Fortunatly gloves are fast. For some reason I’m having a lot of fun tatting for my sampler book. Maybe because I only have to do one or two repeats of each pattern. It’s a bad time of year for it, but I have a new plant growing–a pomegranate, to be precise. After several years of failed attempts, one of the pomegranate seeds I stuck in the dirt has sprouted; it has its two baby leaves and is about an inch and a half tall. Web consensus seems to be that pomegranates will grow in just about any soil, and that they are drought-tolerant but need good watering for the fruit to set properly. I’m going to have to get a largish pot; it gets too cold around here for the plant to live outside all winter, so it’s going to have to be transportable (at least until I have a spot to build a greenhouse on). As they’re self-pollinating, I don’t need to have two plants, which is good because I doubt I have space for two small trees in my house. Even with one I’m going to have to do some bonsai, I expect. Anyway, I’m psyched. If I grow my own pomegranates, I don’t have to have them shipped from California. Scared of intarsia? Knit your argyle socks with short rows instead. The idea is to be able to do a seamless tube. Since there are a couple of tricks for doing that in intarsia I think it’s a problem that didn’t need fixing, but hey, to each their own. 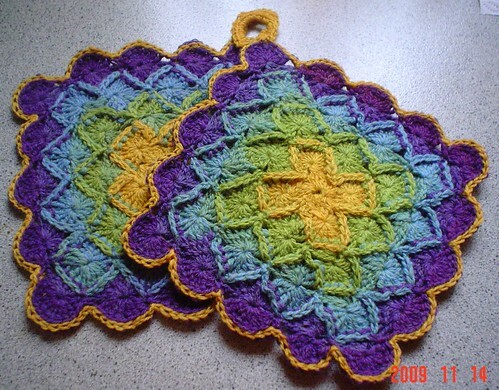 I keep running across patterns for tatting that I’d like to save. But just writing down the pattern doesn’t help me, six months later, remember why I liked a particular pattern, nor is it much use when I’m going through thinking, “OK, I want something with triangular points…” The solution is samples: short lengths of edgings or insertions, one medallion of motif patterns. So I bought myself a cheap small notebook. The problem then becomes what thread to use for my samples, as size 10 crochet cotton will be hopelessly bulky. The solution? I’m tatting my samples in Sulky rayon machine embroidery thread. Not only is it teeny, it comes in hundreds of colors so I can have colorful samples, both for effect and to make constructions easier to see; Round 1 can be red and white while round two is gold and blue, or whatever. There are some problems I’d like to solve before I did any real projects with the stuff; it’s basically impossible to unpick mistakes, picots have to be a little out of proportion to be used for joins, and knots that are not the larks’-heads of the tatting itself are not particularly stable, so I’d need a creative way of dealing with ends. But for this purpose it’s great. Sadly, I can’t use it for crochet examples; it’s just too darn thin and even my smallest hook is too big for it, plus it’s slippery as hell. Crochet will have to be in cotton after all, if I do an example notebook for it. 1)If you could get rid of one or more holidays, which would you remove from the calendar? The ones that are pretty much an excuse to get drunk–St Patrick’s Day in non-Irish communities, Cinco de Mayo in the US, that kind of thing. 2)Which would win in a fight? Bear or cougar? Be prepared to defend your position. Depends on whether it’s a straight-up strength contest or if the cougar can use its superior manuverability. I dunno, I like it. 4)What is your favorite movie quote? It puzzles me that I’m the only person who seems to have a hard time picking “favorites”. I like a lot of movie quotes; I need context! 5)If you could cast your very own reality show, what would it be about and who would the contestants be? I’d redo the BBC’s Surviving the Iron Age, only without silly challenges for the participants to waste time on. I went and bought a new bag yesterday. It’s black, and either leather or pretending to be, and it’s only slightly smaller than the straw bag so I can happily fit everything in it. Plus it sits up straight and has many internal pockets, so I can use it as a purse; I tried to do the thing with cutting down on my stuff in my purse, but it ended up that I was just carrying two bags instead of one, so I think I’m going to bow to the inevitable on this one. The really great thing is that the straps are long enough that I can sling it over my shoulder. I like the straw bag, and always get compliments on it, but those wooden handles are killer for carrying it any distance at all, especially if I put enough stuff in it to use its capacity.